This is a silly little feature I wrote out of the blue one day. It'll allow you to append a new button that makes use of the visitor message wall... the ability to poke your members. The button will show on visitor messages and just above the friend and foe options. You will not see the button on your profile or messages, because it's against the rules to poke yourself.. Fact 1 : Poking alone is not possible and causes anomalies in space and time if you try. 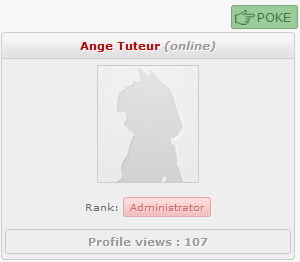 So you can enjoy poking your members instead of space, it's necessary that you have the advanced profile enabled. Do the following and you'll be able to poke to your heart's content ! Fact 2 : Forumotion doesn't believe poking, so we must disable their poke-proof firewall. Do the following and no one will be safe from the Poke ! Fact 3 : Not all members are pokeable. If they don't allow visitor messages or they're selective of their pokers, they'll be poke-proof ! Fact 4 : Poking yourself is a big no-no and goes against everything this was designed for ..! In short; you poke yourself, the very world as we know it will cease to exist. Fact 5 : Poking incites counter-pokes, so prepare to build up a team of pokers to bombard your enemies ( and friends ) ! First we need to add some style for the button, so you can enjoy the poking even more. Go to Administration Panel > Display > Colors > CSS stylesheet and add the following codes to your sheet. If you want to poke people in another language, or change the poke payload, find this part in the logic, right at the top ! poke : The text of the poke button. message : The payload delivered to the pokee's wall. Last thing you need to do is save, and you should now be able to rain poking hell on your members ! If you have any questions, or just want to tele-poke me, feel free to leave a pok -- er, post below. Have fun poking your members ! AH MY GAWD I LOVE IT! This thing is so ridiculous and fun! BTW, I'm quite intelligent and know a lot about physics and I approve the facts provided here. hehe, it came to me one day, after being poked. I shall exact my poking revenge upon all of Forumotion ! @Rhino.Freak wrote: BTW, I'm quite intelligent and know a lot about physics and I approve the facts provided here. Listen to the man, lest you turn to stone ! @Michael_vx It is okay if credit is given to the original author. Such as Author name and link to original source..
@brandon_g wrote: Has this been disabled? Yeah, I installed it here temporarily as a test. Thank you @Ange this is cool members are loving it! Thanks, Ange. My members love poking each other. hi! tried this code out on an invision and it worked for a while, but now the icon no longer appears and this feature no longer works. Was there an update to it? For the second one, it worked well until a couple weeks ago when it disappeared. I just noticed it when i added it into the FT site. It has stopped working on my two forums. I have not installed any new codes recently. @Ange Tuteur I installed this tutorial many months ago. I believe it stopped working when Forumotion released the two recent options. Edit: I did not know how, but the security option was changed back to yes. My issue is solved. It now works, but it doesn't allow all members to poke people. Just some. I saw here that you can 'deny' to be poked,' but can you deny yourself the right to poke? If one of the conditions is met ( All members, friends.. ) you'll be able to poke a user.